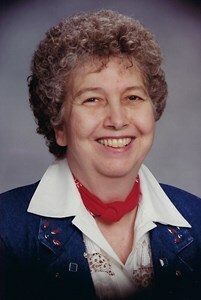 Goldie Marie Kooser, 88 of Topeka, KS passed away April 13, 2019 at Aldersgate Village. Goldie was delivered by her father in Home City, KS February 20, 1931. She was the daughter of William Peter and Della (Barnes) Cook. They preceded her in death. She married Harold Kooser February 18, 1950 in Seneca. He preceded her in death, October 5, 1997. She was also preceded in death by 12 half brothers and sisters, her brothers John, Donald, George, Garland, Max Cook and her beloved sister Claramae Retchless. She was the baby. Goldie is survived by her two sons Steve (Mary) and Dan (Misty) Topeka, six grandsons Bradley (Kelsie) Burlingame, Daniel (Marrissa) Olathe, Jared (Lindsay) Topeka, Andrew (Courtney) Overland Park, Shawn Finley (Jennifer), Brian Finley (Liza) Topeka, Hunter Evans, Lawrence; and three great grandchildren Braxton, Decker and Collins Kooser, Burlingame. Goldie worked 44 years for Southwestern Bell Telephone as an operator. For the past 50 years she has been the matriarch for Kooser Auction Service Topeka. Goldie dearly loved her family and friends……She will be forever in our hearts. Services will be 11:00 am Saturday, April 20, 2019 at Parker-Price Cremations, Funerals & Receptions, 245 NW Independence, Topeka. Burial will follow at Mount Hope Cemetery. Goldie will lie in state after 3:00 pm Friday, April 19 at the funeral home where the family will receive friends from 6:00 pm until 8:00 pm. Memorial contributions can be made to the American Cancer Society or Brookwood Covenant Church 3601 SW 33rd, Topeka, KS 66614. To share a memory of Goldie or leave a message for her family, please click the Share Memories button above. Add your memories to the guest book of Goldie Kooser. Thoughts are with your entire family Steve.Take care may your Mom RIP. We are so sorry to hear about your Mom. You are in our thoughts and prayers! John and Pam (Collins) Eagan. So, so many good memories of your family. We moved to Topeka, and your neighborhood in 1963. Charlie was 2 and Steve was 10. Many shared times with you boys, your mom and dad. While we moved away in 1969 we still shared some good times, going of course, to many many auctions. Your father and mother were special people to us. I think many times we came to the sales just to keep tract of you and your mom and Dad and then later of Goldie. It was always nice to share with them and they always had time for us. Love to you all!! She was a special lady!! Joe and Pat Abbey, sons Charlie, Mark and Darren and Steve sends his love too. Always enjoyed talking to Goldie when we went to the auctions. After mom couldn’t go any more; she would always ask how her and dad were doing. We will miss seeing her. Dan and family: We are so sorry for the loss of your mother. God be with you and comfort you in your sorrow. I had the Privilege to meet Goldie when I went to my first Kooser Auction with Tom Cyphert. He spoke so highly of her all the time and what a wonderful lady she was. I got to know her better when Dan did the Auctions for me to get rid of the Antiques after Tom died. I will miss her. Goldie was always so very pleasant to talk to at the Kooser auctions. Had many years of enjoying getting to see her almost every week. Her family is in my thoughts and prayers. Dan & Family, So sorry to hear about Goldie. My deepest condolences. She will be greatly missed. I met Aunt Goldie when I was 17, prior to marrying her nephew Bob. She was a very sweet and kind lady then as she was over the next 50 years. I have heard she could get a little testy and aggravated, but I never saw that side of her. She enjoyed riding around town with us looking at Christmas lights, we were going to take her last Christmas. We missed the opportunity, I guess thinking we had more time. It will be a regret we will bear. Never wait, time doesn’t. So sorry for the loss of your Mother. We were saddened to receive the message this morning that our dear friend, Goldie, had passed away. She was comical and fun to joke and kid. She loved the outdoors. We would take her on rides to listen to the music in the park, to view the sunsets, and view the flowers in Gage Park and at Lake Shawnee. These trips were very appreciated by your Mother. She is now at peaceful rest in the arms of our Lord and Savior, Jesus Christ!